HHS Secretary Kathleen Sebelius said Sunday that high priority populations will likely have completed the full regimen of swine flu vaccination by Thanksgiving. WASHINGTON (CNN) – Health and Human Services Secretary Kathleen Sebelius said Sunday that it would likely be Thanksgiving before the most vulnerable, high priority populations are completely vaccinated against the H1N1 or swine flu virus. 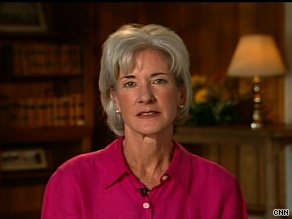 In the meantime, Sebelius said parents and schools need to make back-up plans to deal with possible illness. Sebelius told CNN Chief National Correspondent John King that the administration was “optimistic” it would have a vaccine available by around mid-October. “We’re looking at schools as great partners for possible vaccine programs beginning in the fall to get kids immunized as quickly as possible because this is a children’s flu,” the Obama aide also said. The problem is the 'media flu' and CNN is a major cause. The H1N1 virus contains three strings. A human a bird and a swine string. The nature does not produce such viruses but a laboratory. In my opinion this virus was human created and deployed. Who is profiting from the vaccine$? Or what is the agenda behind it? I will not have my children nor our family members take the vaccine. And we say that's a lot of shots, but as we are nearin' the flu season, it becomes more and more relevant. How about the blue blood flu which apparently has afflicted most North Easterners or the West Coast as well. This makes you think you are more intelligent than anyone else. Only you and your ideals are the right ones which is the height of arrogance. So live in your hives be a drone for whoever is running the country. The smart people will look at both sides and make their own informed choices. Deal with the facts not personal attacks you cant debate the issues and have to get personal on everything. That makes your arguments lacking substance. The only thing I have seen is that the Whitehouse has been and is occupied by morons for at least 16 years going on 17 so far. Any dissenting view makes you a republican well guess what I am a Democrat and I make my own decisions. Yes I voted for El Jefe by the way. Judging by some of the typographical and grammar errors in some of the posts here, it is no wonder that the U.S. is becoming a second rate country. I think everyone that has commented should WAKE UP. First of all, most of us don't keep are own emmune systems up and eat lots of sugars and dairy that bills mucus and bacteria in us. We ALL carry around billions of germs and viruses...but they don't come alive until we lower our emmune system by eating un-healthy. I am not a health freak either...it's just common sense. When people go to work sick and another employee gets sick...it's ONLY because their own emmune system is LOW...and any germs that are on you WILL come alive because you've put too much junk into your own system. Did you all ever notice that kids (when not confined to a classroom) hardly ever get sick during a summer vacation...but as soon as school starts in September and Hollween and and ALL the holidays...straight through Easter arrive...the kids are CONSTANTLY sick with ear, nose and throat issues...WHY...because of junk...and we too get sick. The only final word I have to say is...WE ARE ALL GOING TO GET SICK AND DIE OF SOMETHING...BUT WHY RUSH IT! we have several people in critical condition in our area and this is no ordinary flu. medical personnel are alarmed at their helplessness to do much more than monitor younger people on respirators. (ages impacted are mostly 30-something). Get shots when and where you can for this flu, or prepare now before flu season comes. I dont believe her story.. due to...it is NEW to EVERYONE... so there is no proves if that is WORK or GET WORST. GOD has plan for this. Swine Flue is a hoax. Govt. and the drug companies are the same people. 40,000 people die every single year from the REGULAR FLU! Does anyone every realize that! It's called scare tactics so you will submit to Govt. Just like 9/11, just like the Bankster Bailout, just like health care. "Give us control now or the end of the world will be upon you, but don't worry, government will protect you..." Yeah right! Guess who ran the company who makes the vaccines? Donald Rumsfeld. Big surprise. They are willing to risk the lives of you and your children to make the drug companies billions by selling this "vaccination"
As a survivor of two influenza pandemics, multiple bouts of seasonal flu, measles and chickenpox epidemics, I can say that the best course of action is to stay home and stay hydrated. Take aspirin for fever. Stay warm. Give yourself and yours kids lots of TLC. Lounge around and watch movies. Read books. Hang out in your most comfy PJs. If there are serious respiratory complications go to the doctor and let the doc determine if hospitalization is necessary. These ARE serious diseases and are best managed with common sense. If you think you have the swine flu DO NOT go to your local emergency room. If you do, you will likely wait for hours and spread the virus to everyone around you-including the doctors and nurses. If you are otherwise healthy, the swine flu is NOT any more dangerous than regular flu. However, if you go an emergency department you are likely to be in close proximity to people who could become deathly ill if they contract swine flu-the elderly, cancer patients, etc. STAY HOME, use over the counter decongestants if you feel you need them, drink plenty of fluids just like your grandmother used to tell you and you will get better.